Want to connect with Bambreigh? My name is Bambreigh Porter, I grew up an avid animal lover from gerbils to horses and everything in between! I've always had an interest in animals so I went on to become a veterinary technician. I graduated from this is in 2015. 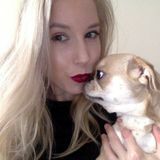 I have since gained a lot of valuable experience with pets, I feel this knowledge gives me the benefit of looking after your pets in every capacity, I can administer medication and also look after any special needs animals. Respectful house sitter as if it were my own!